HP’s first smartbook, the Compaq Airlife 100 resembles the slim and small netbook, although there are some significant differences. The OS is Android 1.6 Cupcake, complete with a resistive touch screen, and the keyboard has been reworked to suit Google’s platform. Keeping the whole thing moving is Qualcomm’s 1GHz Snapdragon processor, a large keyboard (92% of full size), 16GB solid state drive, SD card slot, VGA webcam, and WiFi connectivity. 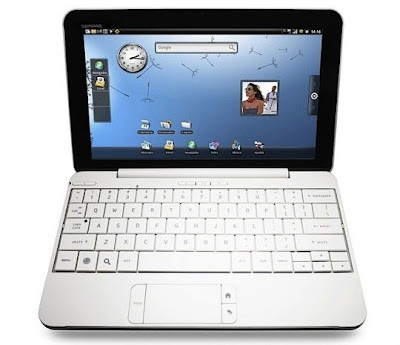 Basically a smartbook is supposed to be the hybrid of a netbook and a smartphones, one thing I like about this is that the icons are larger than you’d find on a regular Android smartphone, and HP have taken the standard webkit-based browser and thrown in tabbed browsing. As far as resume time, with the Airlife 100 it’s ready to use as soon as the lid is opened. One of the advantages of using a smartphone platform is battery life, and even though people are still more comfortable with the Windows environment, it’s proven that there are plenty of users out there who use alternative OS (Linux, Mac, and Android). The battery life has been cited to last for 12 hours and boasts a standby time of 10 days. The European market can expect the HP smartbook this spring and details on pricing and worldwide release were not mentioned yet. Will HP finally intensify their Compaq brand with the Airlife 100? The AirLife will probably have access to the Android app store with applications optimized for a small screen. Another is the instant startup time and comprehensive connectivity suite (from Wi-Fi to HSDPA and even WiMAX) which keeps this device always online. I expected the smartbook OS to be updated to be like Android 2.1 but maybe they have not optimized it yet for smartbooks. Android came from linux in which I believe will be easy to get used to and has some unique features not in windows (and vice versa). Having been exposed to Android OS from HTC smartphones, I find the Android OS to be more fancy and quite easy to learn. I will be expecting as well to have “extended screens or desktop” similar to that in smartphones which I like.